The last year has seen an alarming rise in armed conflict, social bigotry, and political authoritarianism. At the same time, unprecedented numbers of people around the globe have rallied to resist the politics of hate. Many of us have felt fear and motivation, isolation and empowerment, disillusion and hope. 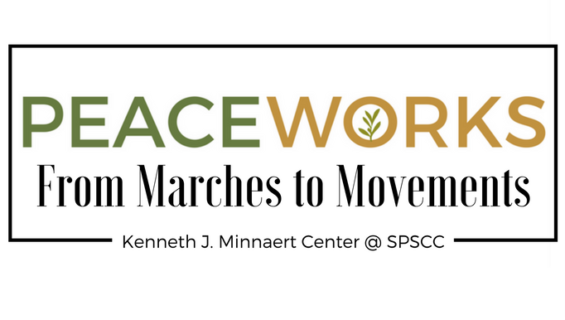 Peace Works 2017 asks how we might harness these passionate feelings into effective social movements. What tools do community groups need to better organize themselves and network with others to meet vital needs? How can individuals become engaged and empowered in the political process to affect public policy? How have successful movements and campaigns shifted public opinion and won elections? How might we reach out, build coalitions, and turn a passion for peace and justice into strategic victories? How can we envision and craft policies and institutions for a better world even as we fight to preserve the gains of recent decades against reactionary and regressive forces? Saturday, October 14, 2007, the Rachel Corrie Foundation for Peace and Justice hosted its 11th Peace Works conference, From Marches to Movements, at South Puget Sound Community College in Olympia, WA. The day was filled with workshops, panel discussions, presentations, and networking opportunities. People and organizations from Washington and beyond came together to develop concrete strategies for justice, peace, and progressive social change. Matt Remle (Lakota) will discuss how Native-led movements over the past few years have built successful campaigns and coalitions towards shutting down Tar Sands pipelines, abolishing Columbus Day, a global divestment movement targeting financial institutions, and more.